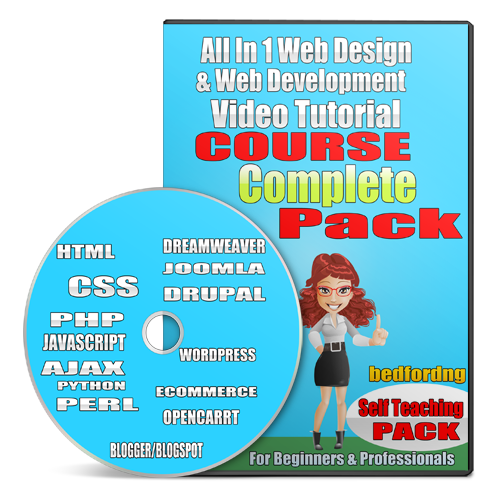 All In One Website Design And Web Development Video Tutorial Course. you too can become a professional website designer and web developer by learning how to design and develop website after watching this video tutorial course.this is one of the easy way you can learn how to design website without spending much.you sit at home and watch the video courses which has lots of web design and development video showing you how to design website from scratch and also designing of website using software such as joomla, wordpress, drupal, ecommerce site, dream weaver and lots more other tools that is never before seen.all this is packed into one so you can learn from basic, beginner to advance stages. now you can see how detailed this pack is because you can decide to start learning from basic, beginner stages if you are not yet grinded or you can decide to continue from advance, professional stage if you are already grinded from beginner stages. building website and also creating web app makes your web development a breeze.take your website design and web development skill to a professional level by watching this video tutorial course. you don't have to spend much going for institutional course since you will get grinded after watch a live video tutorial on how a website is created from scratch to finish.how they constructed the website template from scratch to finish.this is an all in one pack for website design and development which you can't get else where. this package cost #7000 only.where else can you get it this cheap other than via productng. this is what other people are selling for #20000. now you are getting everything at #7000 only. hurry and get yours before i increase the price to the normal #10,000. to get this package, you will either meet me one on one to get it all if you reside in Lagos but if you are residing in other state, then we have to make arrangement.so contact me first via the number on this site before any transaction.